When activists on the left have talked or written about race and class, we have most commonly adopted an imaginary scheme in which there were two groups of people, the workers, and a black or migrant community, whether of Cardiff in 1919, the East End in 1936, Southall in 1979, Bradford in the early 1980s, or wherever else today. Many of us have enthused in those moments when the two groups have seen that they had the same enemies and the same interests. But in so doing we have treated race and class as two parallel streams, sometimes bearing together, sometimes pulling apart. When we have thought of the members of the working class we have assumed them to be white, just as we have assumed them to be male, straight, and not disabled. And when historians have written about race or class, they too have written about them separately, with race at the edges of EP Thompson’s Making of the English Working Class, and class present but pushed away from the centre of Rozina Visram’s Asians in Britain or Peter Fryer’s Staying Power. 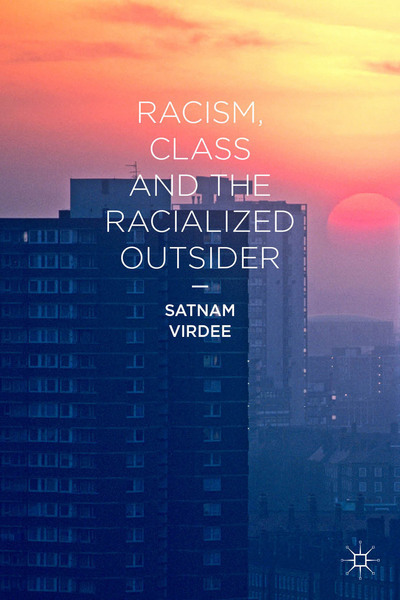 Satnam Virdee’s book tells the history of the working class and the radical left in Britain through the past two centuries, focussing on the workers and their allies, and showing how their socialism, and their class projects, had a continuous racial content. His book begins at the end of the Napoleonic wars, showing the centrality to Peterloo-era London radicalism of Robert Wedderburn, the child and grand-child of black slaves, and a champion of the link between English poor and the victims of the slave trade. Wedderburn is thus the first of a series of figures, Virdee’s “racialised outsiders”, whose experiences and background made them alive to the complex situation of the British working-class, right at the heart of an empire based on the oppression and murder of countless black people, and who used the support of the left, repeatedly, to travel from the margins to the centre of working-class campaigns. The English working class which gave birth to Chartism, Virdee shows, was a class composed in part of hundreds of thousands of recent Irish migrants. Feargus O’Connor, the champion of physical force Chartism spoke to his mixed Catholic and Protestant, English and Irish audiences of the scabs and sores suffered by the Irish poor, and warned them that their fate would be the same unless they rose. With the decay of Chartism and in the forty years of defeats that followed, Virdee accepts, Orange and anti-Catholic campaigns struck roots within the class (there were countervailing tendencies among the London Chartists, and in the North East, where Joseph Cowan was able to sustain a mass following); only to be pushed back again with the unemployed agitation of the early 1880s and New Unionism. Among the cadres of the latter were a series of racialised outsiders, among the best known of which were the second generation Irish and Jewish immigrants Will Thorne and Eleanor Marx, who opposed among their contemporaries’ anti-Catholic and then anti-Jewish racism. To insist that the left and the working class had racial identities is not (for a second) to assume that the left or the working class were consistent champions of equality. Among the less attractive figures of Virdee’s narrative are individuals such as HM Hyndman (the intellectual leader of Britain’s first socialist party, the SDF), who slipped easily into a language of British imperialism and anti-Chinese and anti-Jewish racism. Virdee points to the opposition to Hyndman within the SDF’s East End branches and Jewish members. He could perhaps have taken the point further: the latter were ultimately to defeat Hyndman, who was deposed as leader, and the anti-Hyndman majority of the SDF (by now renamed the British Socialist Party) formed the core of the Communist Party of Great Britain on its foundation in 1919-1920. Ben Tillett appears twice in Virdee’s text: as one of the Irish Catholic migrants who were in the leadership of the 1889 dock strike, later as an opponent of Jewish migration to the East End. There were several similar episodes in Tillett’s later career, including admiration for the proto-fascist Bottomley and the actual fascist Mosley. (Havelock Wilson, leader of the Seamen’s union, had a similar trajectory) Yet, the same background and experiences (the SDF, the dock strike) also shaped Will Thorne who writes in his memoir about the unbearable working conditions in the Beckton Gas Works, which he went on to organise, “These incidents made me understand the full significance of the term ‘wage slave’”, a sentence which suggests that Wedderburn’s sixty-year old arguments for the similarity of slavery and industrial work had not been entirely forgotten. Virdee’s account of the 1919 riots shows the role of Manny Shinwell, normally presented as one of the ILP and then Labour’s left heroes, as a key instigator of the racist riots in Glasgow. But, he insists, into the 1920s, such ideas were pushed back thanks in part to the work of early Communists such as Rajani and Clemens Palme Dutt, Shapurji Saklatvala, Zelda Kahan and Arthur Macmanus (Saklatvala, later Britain’s first Communist MP deserves rather more credit for this than Dutt who was not in Britain between 1924 and 1936). A key moment for Virdee was the decay of a certain way of doing race at the end of the postwar boom. This began with the dockers’ march for Powell; in the middle of what was supposed to the revolutionary year of 1968 it was quite apparent than even one of the best organised and most militant sections of the working class was willing to support overt racism. The generation who experienced Powellism with the greatest shock (Widgery, Fenn) were – as Virdee documents – later central to the later success of Rock Against Racism and the Anti-Nazi League, and the winning of an argument for equality within the political left. There is another book to be written which would take further Virdee’s approach, in which class is seen still through the individual biographies of many hundreds of left-wing activists, further down, into the values and behaviour of the people who sat at the back of the hall during union, left or tenants meetings. And in that total history there is, I think, a little more to be said about gender – whether of the women who led the Glasgow rent strike and achieved for 70 years the partial nationalisation of Britain’s housing stock (arguably the most successful single campaign in the long history of the British working class), or of the men and women whose relationships fuelled in turn the mid-twentieth century anxieties about miscegenation which appear as a consistent, recurring theme of racist campaigns from 1919 to 1979. That said, the point where Virdee is gloriously right is to break apart the starting assumption that there was ever something as simple as “class” from which race was absent. It is for this reason that his book deserves the widest reading. There has been a lot of talk about intersectionality on the left in the last year; Virdee relocates the first meeting point of race and class from outside to within the class and shows that race, racism and anti-racism were present within the British working class from its first making.